최고의 입지를 자랑하는 4성급의 Olinda Rio Hotel은 세련된 코파카바나 비치에 자리 잡고 있으며, 멋진 바다 전망을 자랑합니다. 이 호텔은 크루아상, 과일, 갓 구운 페이스트리 등으로 구성된 조식 뷔페를 매일 제공하며, 무료 Wi-Fi도 이용 가능합니다. 현대적인 디자인을 갖춘 Olinda Rio의 스위트는 따뜻한 회색톤과 고급 목재 가구로 꾸며져 있습니다. 모든 객실에는 에어컨, 케이블 TV, 미니바 및 금고가 마련되어 있습니다. 고급스러운 객실에서는 바다 전망을 감상할 수 있으며, 룸서비스도 이용 가능합니다. 이탈리아 대리석 바닥과 크리스탈 샹들리에를 갖춘 Venezia Restaurant에서 브라질 및 프랑스 퓨전 요리를 맛보십시오. 코파카바나 요새는 Olinda Rio 호텔에서 2.6km, 시케이라 캄푸스(Siqueira Campos) 지하철역은 750m 거리에 있습니다. 산토스 뒤몽 공항까지의 거리는 10km, 갈레앙 국제공항까지의 거리는 25.3 km입니다. 브라질 연방법 8.069/1990에 따라 18세 미만의 미성년자는 부모 또는 보호자를 동반하지 않고 호텔에 숙박할 수 없습니다. 미성년자가 부모 이외 다른 성인과 동반하는 경우, 미성년자의 호텔 숙박을 허용하는 서면 승인서를 제시해 주셔야 합니다. 해당 승인서는 부모 모두가 서명하고 공증을 받은 것이어야 합니다. 또한, 18세 미만의 모든 미성년자는 본인은 물론 부모의 사진이 부착된 유효한 신분증을 제시하셔야 합니다. 해당 사항은 미성년자가 부모를 동반한 경우에도 마찬가지로 적용됩니다. Ask for a sea view and you'll get it! But book in advance as it's a small hotel. 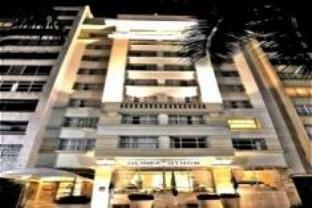 Friendly, efficient staff, very good breakfast and a simple but comfortable, clean, spacious room. We'll be back, Olinda Rio! Wish we had of found this hotel sooner. Straight across the road from beautiful Copacabana Beach. Nice rooms for the price and great value compared to other hotels nearby. Everything was nice, my 2 complaints were: A/C had no thermostat, only on/off switch so it was too warm or too cold, no middle ground. Guest policy, their 1 guest per length of stay will keep me from staying here again. I booked for my friends.They were quite satisfied. Beautiful views from the good sized rooms, excellent breakfast, super service with a smile and within walking distance to many nice restaurants, shops and of course the copacabana beach right across the street. We were six couples came from a cruise and stayed extra four days after the cruise and really enjoyed staying at the Olinda Rio.. If you are interested in finding a taxi driver, the doorman can help you. If you speak Portuguese, you can on your own find an all day driver for a cheaper price, but if you speak only another language and can't barter with a taxi driver for a better price, the price arranged through the hotel is better than what would otherwise be offered. Ubicación,atenciön del personal del hotel,desayuno. Solo estuvimos una noche de paso hacia Angra. Todo perfecto,los empleados muy atentos y dispuestos para informar que hacer en Río,restoranes,etc. non è in stile moderno ma ha tutti i confort necessari. ottima posizione e ottima colazione per tutti i gusti! il soggiorno è stato piacevole con il personale molto professionale e disponibile, le camere sono ampie e pulite,la colazione è ottima e abbondante, quello che ci vuole per iniziare la giornata nel modo migliore. Zoals vaker tonen de foto’s waarschijnlijk net gerenoveerde kamers. Toegewezen wordt een kamer die duidelijk zijn beste tijd gehad heeft. Provisorisch herstel van beschadigingen. Ladekast zo oud dat de lades nauwelijks meer open gaan en scharrige, niet bij de kamer passende lampjes.